Even though the Big 12 might not be the most stable conference among the major ones in College Football, there are powers trying to push for an expansion to big TV markets, with Central Florida and Cincinnati the likeliest of candidates. A lot of the future plans for the Big 12 becoming bigger than 10 teams have to do with the identity of the next Texas Athletic Director, as Oliver Luck, the Director of Intercollegiate Athletes at West Virginia, is one of the premier candidates, having engineered the Mountaineers departure from the Big East (now the AAC) and procured money for a new baseball stadium. But it’s not just Luck that’s pushing for more teams. In the reality that’s been formed over the last few years, it seems like it’s been a lot of eat or get eaten. The Big 12 lost Texas A&M and Missouri to the SEC, Nebraska to the Big Ten and Colorado to the Pac-12. For a moment there, Texas and Oklahoma were on the verge of forming a Pac-16 and breaking the Big 12 apart. The Big 12, however, brought in TCU and West Virginia, keeping it a 10-team conference, with better money sharing for current members. Rumors coming out of several media outlets including in West Virginia suggest that Fox Sports is behind the power moves by the Big 12 to attempt and expand, especially keeping an eye on Florida and the Midwest. There were previous talks about Florida State, which would be somewhat of an earthquake for the ACC, but that’s off the table for now. So who is there to take? 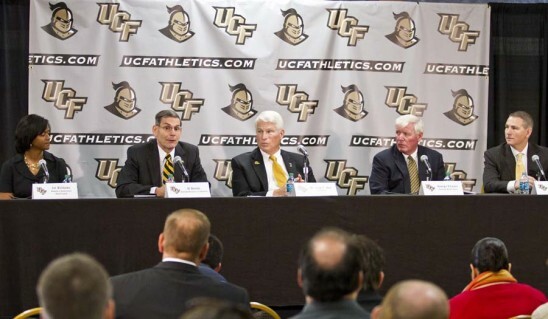 The University of Central Florida, playing in the AAC, is having a strong season, but most importantly, they reside in a big TV market, not to mention being a part of the desired recruiting fields in Florida. TV money is important, but having a chance to tap in to the gold mine that is Florida high school football is also something Big 12 teams would clearly be in favor for. But if you’re adding an 11th team, there needs to be a 12th, right? South Florida, a more established football program than FIU or Florida Atlantic has come up as a candidate a couple of times, but is it really wise to recruit two teams from the same state? That brings us to Cincinnati, who seem like they’re just waiting for someone to take them out of what has become of the Big East. The Bearcats are in a smaller TV market than USF (Tampa), but Ohio is another region conferences would like to tap into in terms of recruiting talent.